Aglianico is a perfect wine to turn to on such evenings. I definitely speaks of warmer places like it’s home in southern Italy. It’s exactly the type of wine that acts like a cuddly blanket, since it tends to be big, bold, and full of dark cherry, plum, chocolate, and spices. We recently decided to dig into our “cellar” stash to open just such a bottle for a comforting dinner in. This grape is not for the faint of heart. It has richness, weight, structure, and longevity . . . but for all this you must have patience and wait for it to come together with age. It is typical of Campania and Basilicata (today’s wine is from the latter), and can be found elsewhere in southern Italy. (Click here to see a map.) It tends to be quite high in tannin, which can be really overpowering in the wine’s youth. Luckily, that tannin is also balanced by lots of acidity, which is really important when you’re dealing with a grape that makes such big wines, particularly from a hot region. With this structure, this is a grape that definitely lends itself to aging well when made by quality producers. Lighter, easy drinking styles are made as well and can be really lovely for more immediate consumption, but the higher end versions will continue to improve in the bottle for over a decade. 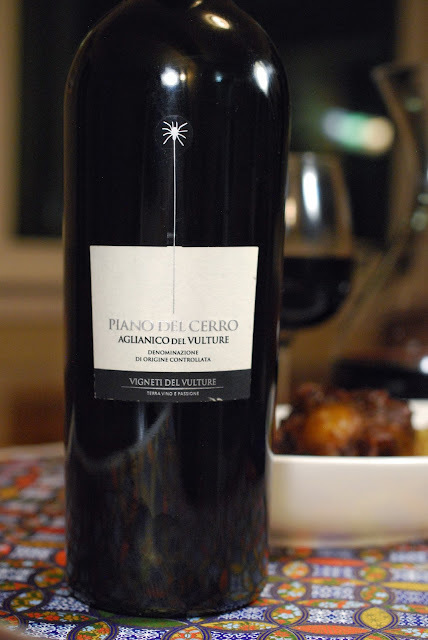 On this evening, we opened the Vigneti del Vulture Aglianico del Vulture Aglianico del Vulture Piano del Cerro 2009. I had this bottle hanging around in “the cellar” for some time. Nine years is actually still a little bit young for this wine, but I figured why not? Better too young, than too old. In fact, the wine was in a GREAT place on the day we opened it. Greg and I picked up notes of warm black cherry compote on the nose, with a mix of black and red berries and smoked plums, a little black tea, licorice, spices, pepper, rosemary, and bramble. It was closed on the nose to start, but then it opened up nicely. It’s a modern style wine, and many of the same notes continued on the palate, along with notes of kirsch, stewed fruits, warm earth, and violets. In addition, there were hints of orange peel, sage, potpurri, blackberries, exotic spices, and smoke. There was a comforting warmth to this wine. It was generous and round even upon opening, but it just continued to open up and unfurl luxuriously with time–I would definitely recommend decanting. Even after the nine years the acid was very bright (medium+). It was full bodied with medium+ tannins that were dusty but smooth. Frankly, this wine was bang’n! We enjoyed every last drop. That said, I think it could age much longer. The chilly day and the wine both seemed to call for something meaty and comforting. A braised dish was decidedly in order. I decided on oxtails, which despite the name actually usually come from the the tail of the cow. We also thought it would be nice to play up the fragrant notes of licorice, herbs, and spices, so I added tarragon, rosemary, and anise to the braise. These sent off beautiful smells from the kitchen while it all cooked in the oven. I added parsnips to the braise, but feel free to switch in other root vegetables. To soak up all the delicious sauce, I decided to serve pearled barley as a side, which has a light nutty quality that I thought would be a good complement to the wine. I also added a little orange zest to play to the brightness in the wine, as well as a little tarragon to continue that thread from the braise. It was a fabulous combo! It was all as comforting and luxurious as I’d hoped. The wine was smooth and velvety alongside the food. The notes of kirsch and licorice really came out int he wine, as did the bright note from the orange rind in the barley. Greg said that the wine and the food were "both complex, warm, round hugs to the mouth." We ate it greedily ourselves and saved the extras for leftovers–as with most braises and stews, the sauce was better in the following days. Even though we kept this all to ourselves this time, it would be an ideal dish to make ahead of time and serve for a dinner party. 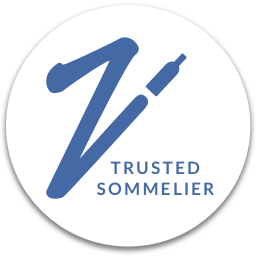 Vinification Process: Pre-fermentative maceration takes place at 41°F for 10 days and is followed by fermentation carried out using natural yeasts for 60 days at a maximum temperature of 79°F. Aging Process: The wine is put into new barriques for 24 months. Recommended Cellaring: 10 to 15 years. The SRP at the time of release of this wine was $37. At that price, this is an Attainable Indulgence and it fully delivered on every level. Of course, quite a bit of time has gone by–the average price on Wine Searcher for this vintage is $44, which I still find quite reasonable for this wine. cheeses. Wine Folly also has more helpful recommendations for Aglianico pairings which you can find here. Altogether, this is a big wine and it should have robust fare to accompany it. On the flip side, if you’re looking to pair another wine with this dish, don’t hold back and feel free to put your big, bold reds up against it. 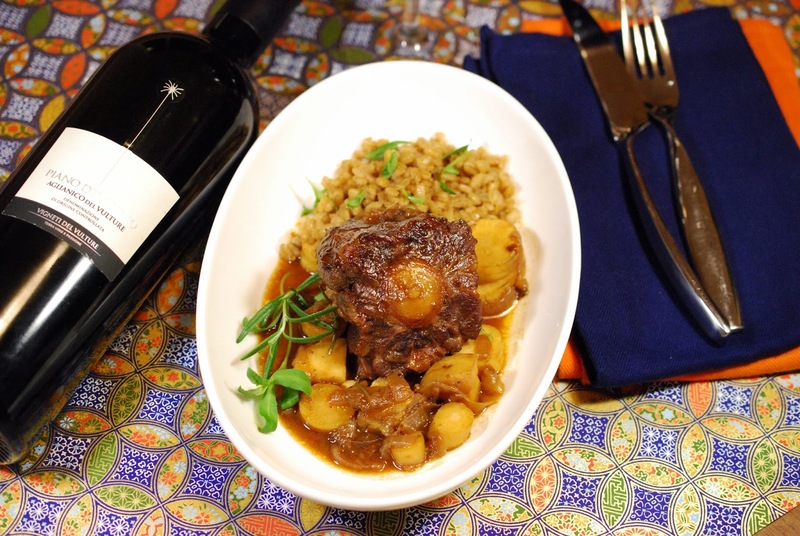 I would say that the earthiness of an old world wine works well with the light gaminess of the oxtails. Similarly, I think you’re more likely to find similar licorice spice notes in old world reds as well. 2. Season oxtails with salt and pepper. Heat oil in a Dutch oven or large pot over medium-high heat. Sear the oxtails in the oil on the top and bottom until well browned, about 3 to 5 minutes per side, working in batches as necessary. Transfer the oxtails to a separate platter. 3. Add the carrots and celery to the hot oil and lightly brown. Add in the sliced onions and cook for another couple of minutes. Add in the tomato paste and the flour and allow it to cook for another minute or two. Deglaze with a little bit of the wine. Add the garlic, bay leaf, herbs, the anise pods, and salt and pepper. Pour in the rest of the wine and the stock. Bring the mixture to boil, then reduce to a simmer. Add the oxtails back in. The liquid should come about ¾ the way up the oxtails–if needed add more liquid. Cover the pot and transfer the pot to the oven. Tip: If you have a tea steeper, fillable tea bag, or cheesecloth, fills with the bay leaf and anise pods use this to steep these in the stew and easily remove them later. Additionally, you can also tie together the herbs with kitchen twine to also make it easier to remove them later. 4. Cook the for an hour then add in the sliced parsnips. Cook for an additional 2 hours, or until the meat and the parsnips are tender. Taste and adjust seasoning with salt and pepper. 5. When ready to serve, remove the bay leaf, anise pods, the herb stems, the celery stalks, and the carrot pieces if too soft. 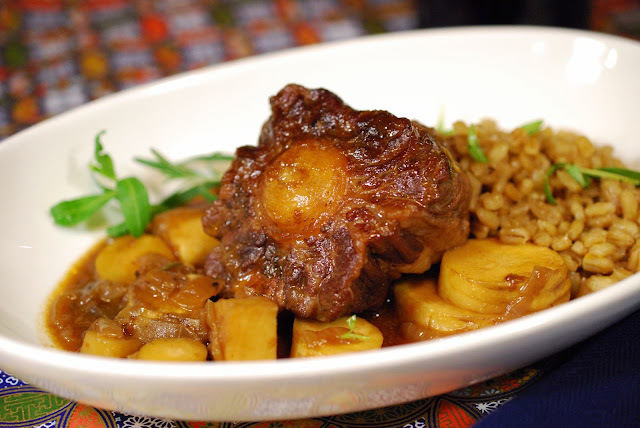 Serve the oxtails with the stew and the barley. 1. Melt butter in a pot. Add the barley and toss in butter to coat well. Allow to cook and toast for a minute or two. Add in the onion quarter. Season with salt, pepper, and a bit or orange zest. 2. Add the liquid to the pot and bring to a boil, then reduce to a simmer. Cook and cover for about 45 minutes. 3. Let stand for 5 minutes then fluff with a fork. Season with additional salt, pepper and more orange zest if desired. Toss with the tarragon just before serving. Serve with the oxtails. Credit on all photos to Greg Hudson. A beautiful dish that sounds perfect for the alluring flavors of the Aglianico! I'm not sure my husband would eat oxtail, but I'm all in for making it, especially with the kind of weather we've been having. Thanks for sharing your recipe, Nicole. Thanks Lauren! Despite the name it's actually the tail of the cow so it's actually not all that gamey (actually going to add that in -- thanks for the reminder.) Hope the weather warms up! Barley scented with orange and tarragon sounds fantastic - those are such beautiful, fragrant flavors. I didn’t prep a meal with my bottle but it was served with a risotto bar and I think that concept is delightful for a wine tasting! Thanks Jill. And I so love the idea of a risotto bar! 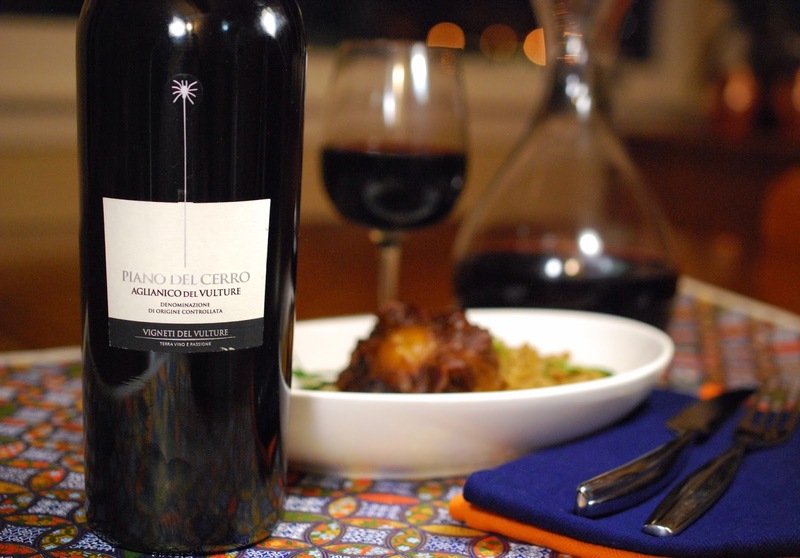 This wine screams for rich braised dishes such as this. Love it!! Thanks --- it really was sooo tasty! Great post and pairing. I enjoyed your tasting notes and then recipe development to complement the Aglianico. 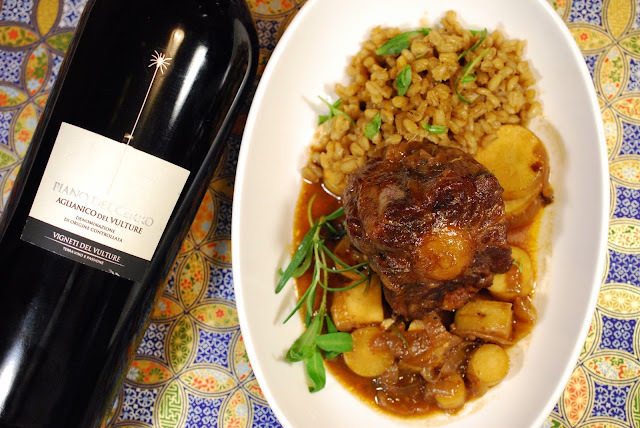 You got hugs from your pairing, I was left with a big smile when I paired Aglianico with braised lamb. A rustic braised dish seems to be just the right pairing along side Aglianico. Cheers! The lamb dish looked really delicious too! I can totally see that generating mouth hugs! I must admit I felt little guilt over our geed ;-). Thanks Lynn! Nicole, this looks amazing! Honestly, I've never cooked oxtail. But I loved it. You've inspired me. Thanks Camilla -- it's really not difficult. Just about the same in technique as any braise. Let me know if you try it! Bravo for serving oxtail! It's not usually at top of mind in the US, I especially love it slow smoked for hours. Perfect choice with Aglianico! Ooh I love the idea of having them smoked! Yet another reason to get a smoker as soon as we have a place for one. Greg has been wanting one for years! Looks like an amazing pairing and definitely a bold wine for some colder temps. Glad you've joined our group!